Just like you, your pet gets sweaty, dirty and down right smelly. 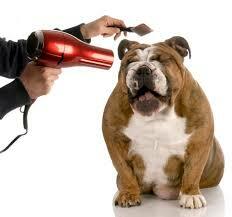 We can give them a much needed bath, a trim and give them back to you shining like a new penny! Make your reservation today to get all cleaned up and ready to go! But...we only do pets, sorry! Why don't we put grooming prices on our website? Each dog is different with their own needs. Some dogs require a lot of attention as their coats are different. Some may be groomed on a regular basis making them easy to maintain while others may come to us now and then making grooming more difficult. Finally, some dogs are tiny, others are HUGE so our time involved would be widely different. Also, keep in mind that around special holidays we get very busy as everyone wants their pet looking party ready so call us for pricing.